Malaysian flight 370 is still missing and that's big big news. 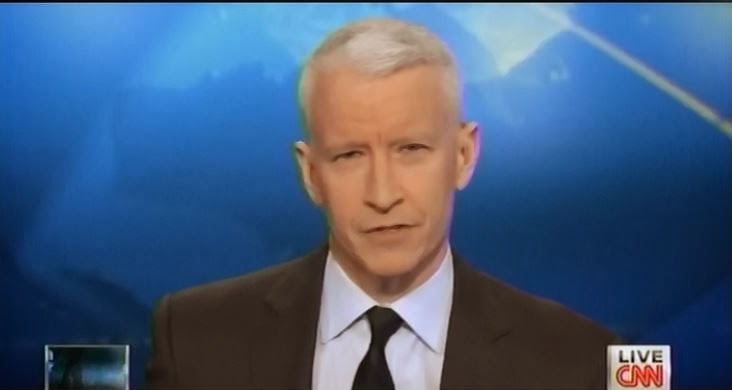 Anderson covered a great deal; he talked to Jim Sciutto, Jim Clancy, Fran Townsend, Mary Schiavo, Pamela Brown, Capt. Chesley Sullenberger and Capt. Jim Tilmon. Anderson also had a segment taking with the brothers - James Wood, Tom Wood - of one of the Americans from the missing flight. Covered topics included the latest update, terrorism questions, international airport security, stolen passports, an analysis of the Boeing 777 and airline safety in general. It was all well done but even with the addition of Capt. Sullenberger began to drag a bit. I did check out Hayes (who covered flight 370 in his first segment then moved on to other topics). Anderson and Robin Curnow discussed the Oscar Pistorius trial and then there was a panel with Sunny Hostin and Mark Geragos (who looks better in a regular tie instead of a boyish blue bow tie). Hostin had a problem with how Pistorius became upset and ill during graphic testimony of Steenkamp's wounds. She saw it as a "performance" and there was something "off" about the behavior. Now for a personal story. I have been called to jury duty twice. The first time I was selected and questioned for a double homicide case. The judge asked how much it would bother me to see photos of gory bloody scenes and dead bodies. I wasn't sure but said it might and maybe that's why I wasn't chosen to hear the case. I can imagine that some people, maybe horror/slasher film fans, wouldn't be bothered. I would mildly freak out when my (now RIP) cat Hoosier would leave half-eaten baby bunnies on the porch. Some folks can't handle it and would break down even when just hearing someone talk about blood and bullet holes and the death of someone you loved. I saw nothing wrong with Pistorius' behavior. There was an update on Ukraine, a Bulletin (I think?) 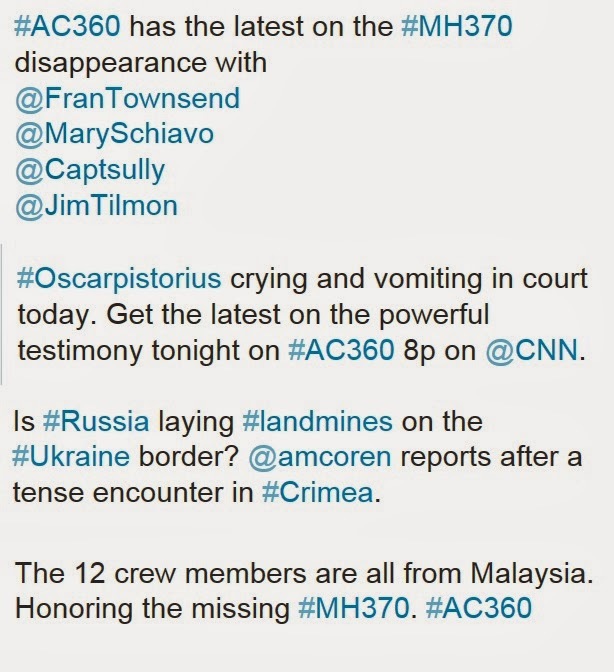 and a flight 370 wrap-up. At the end of the Hostin and Geragos panel, Anderson mentioned the two of them would be on another show coming up later, "Making the Case" at 10:30 PM. Dan Lemon has his own show from 10 PM to 10:30. I didn't see either show but "Making the Case" sounds like it belongs on HLN sandwiched between Jane Velez Mitchell and Nancy Grace. Both shows sound like temporary fillers. 3/10/14 Tonight Anderson had quite a full show &variety of guests. The mussing plane episode gets more mysterious all the time. Ac seems to ask some pertinate questions but there seens no definite answers which frustrates everyone. Not much interested in the Pistorius trial these things are so dragged out. The situation in Ukraine is troubling wonder if AC will go back the world situation is shakey & Andersons fans look forward to his reports.so far I have stayed faithful to his reporting but might try to locate other stations to see what they report Our carriers dont always show comparison channels. AC mentioned the Air France plane in 2009 that took a while to be discovered and I'd forgotten that--but the surrounding the Malaysian crash is still very strange, even with Mary Schiavo's certainty that it would be found. Anderson's interview with the brothers of one of the passengers was good--Anderson always handles these types of interviews well and sensitively. The Oscar Pistorius trial doesn't interest me and I was annoyed with the Hostin/Geragos plugs on 360 since I still miss AC360 Later.